People aren’t overcome by situations or outside forces. Defeat comes from within. Truly great people emit a light that warms the hearts of those around them. When that light has been put out, a heavy shadow of despair descends. Recognizing how totally ignorant you are is the only honest way to deal with people who’ve been through something traumatic. It was so gorgeous it almost felt like sadness. It was all your imagination. And imagination is sometimes worse than reality. If people I don’t care for are attracted to me, I accept it as the wages of beauty. It was the truth. I felt a yearning love for every instant that passed. The ritual of our daily lives permeate our very bodies. I love feeling the rhythm of other people’s lives. It’s like traveling. No matter where you are, you’re always a bit on your own, always an outsider. Again and again I will suffer; again and again I will get back on my feet. I will not be defeated. I won’t let my spirit be destroyed. Everything in life has some good in it. And when something awful happens, the goodness stands out even more–it’s sad, but that’s the truth. Banana Yoshimoto was born in Tokyo. She is the pen name of Japanese writer Mahoko Yoshimoto. She writes her name in hiragana. She graduated from Nihon University's Art College, majoring in literature. Yoshimoto began her writing career while working as a waitress at a golf-club restaurant in 1987. 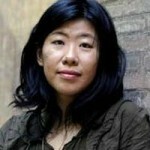 Her debut novel, Kitchen, was an instant success, with over sixty printings in Japan alone. Another one of her novels, Goodbye Tsugumi, was also made into a movie in 1990, directed by Jun Ichikawa. The novel received mixed reviews. Her works include 12 novels and seven collections of essays which have together sold over six million copies worldwide. Yoshimoto was awarded the 39th edition Best Newcomer Artists Recommended Prize by the Minister of Education in August 1988 for Kitchen and Utakata/Sankuchuari. In March 1989, Goodbye Tsugumi was awarded the 2nd Yamamoto Shugoro Prize. In 1994 her first long novel, Amrita, was awarded the Murasaki-shikibu Prize.